Mulch limits water evaporation, suppresses weeds, and contributes to the overall health of the soil. The mulch we offer is ground green waste from the County’s yard waste collection programs, and there are several easy ways to complete the loop and put the material to work literally in our own backyards. Mulch can be picked up at no charge at the South Coast Recycling and Transfer Station. There is a small fee if you want the mulch loaded for you. Call 681-4345 for hours and availability. 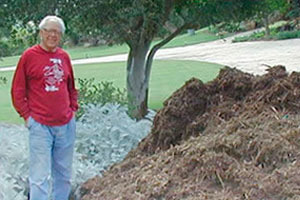 Mulch can also be picked up at no charge at the Santa Ynez Valley Recycling and Transfer Station. Again, there is a small fee if you want the mulch loaded for you. Call 688-3555 for hours and availability. County trucks can also deliver mulch to you for as low as $10 per ton. The mulch purchasing agreement and pricing can be found on our Mulch Program page, or you can call 681-4981 to learn more about our mulch delivery service. For more information about the benefits of mulch and the different ways to obtain the material, please visit our Mulch Program page.